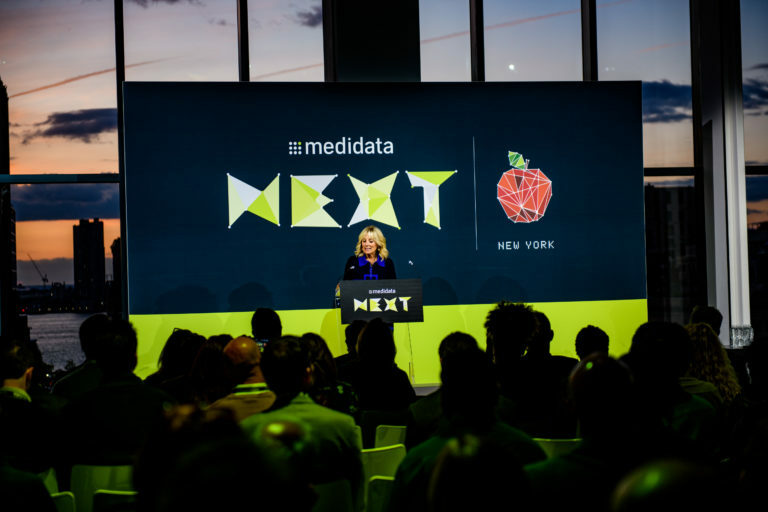 Medidata Next NYC is in the books, and we’re still trying to catch our breath (and some sleep) after powerful conversations with industry leaders, innovators, and clinical trial superheroes. We were honored that Dr. Jill Biden—educator and former Second Lady of the United States—joined us to share her message to improve patient care. “First, Glen [de Vries], thank you for today’s commitment that you made to STEM education, patient advocacy and global inclusion that you announced. As an educator and co-founder of the Biden Cancer Initiative, thank you, because that’s a very personal connection for me. And as Glen mentioned, Medidata participated in the Biden Cancer Initiative in our national summit in Washington D.C., alongside with 450 community summits all around the country. It was pretty neat to see how many people really want to work together on the issue of cancer. Through the Biden Cancer Initiative, the Biden Foundation, and our son’s Beau Biden Foundation for the Protection of Children, Joe and I are still really working on the issues that really we’ve worked on our whole lifetime and through our administration in the White House. I’m sure you’ve had a lot of technical speeches and technology today, but I’m going to talk to you really about our capacity, as individuals and as a community, to do what we can with what we’ve got. To find the courage together to reach for what seems to be impossible. It’s easy to think of healthcare in terms of statistics, in costs and outcomes. But we can’t forget that it’s the people, the patients, who matter the most. Every patient is a mother, a grandfather, a son or a daughter. And if our healthcare isn’t giving them the tools they need to conquer their illness, then we’ll fail. We need to keep people at the center, the center of our research. None of us know where life will take us, but we all have the chance to make a difference with the talents and the opportunities we have. Many of you have already found a way to use your gifts. You’re helping to advance the most cutting edge science around. You’re connecting patients with treatments that will give them a better quality of life. You’re empowering the medical community to do more with what we already have. bring to this field that no one else can? How can you use your unique perspective to push innovation in your own teams and industries? As Second Lady, I wasn’t a perfect vessel, but I put myself out there. I took the risk and I didn’t waste my platform. You cannot waste yours. There will be times in your life, whether you seek them out or not, when an opportunity presents itself; when your voice can change the conversation. But you have to be courageous enough to use it. We still have a lot of work to do, don’t we? It will take diligence and persistence and incredibly hard work. We can make changes if we use our strengths in the service of our mission. But we’re never going to do it alone. We need each other. One of the things that I’ve learned most from my students is that there are times when we need to lean on the people around us, and hope that we can carry the weight of our lives together. As you know, progress is uneven. Rural, black, Latino and Native American communities all see less positive cancer outcomes. Poverty draws a line between surviving and succumbing to the disease. Cancer is the second most common cause of death for children up to age 14. And cancer rates for this age, for that age group, have actually increased over the years. That’s heartbreaking. Despite decades of research, billions in funding, and the best minds in science working on this disease, there is still no word as frightening as malignant. The challenges we face are daunting. We need diligent people like you, working your hearts out, just like you do every single day. We must all play our part. But we can’t do it alone. We’ve got to work in community, lean on each other when we feel weak. Be vulnerable with each other. Be a pillar for someone else. The challenge ahead of us is great. We have so much to do before we can say, not one more mother, not one more grandfather, not one more son. But all of you are getting us closer to this world every day. You are giving families new hope, and that is a beautiful thing. Thank you, Jill, for inspiring us. Your spirit reinforces our mission as we use our talents every day to advance research for patients around the world.